Indian Airline landed me at Goa’s Dabolim airport, on time at 11.50 on Wednesday 5 April. I decided to stay in a small coastal town, Vasco da Gama, and not in Panaji (Panjim), the capital, about 25km further to the north. May be I wanted to pay respect to the famous Portuguese sailor, Vasco da Gama, who was the first European to sail round southern Africa and with the help of an Indian pilot hired from Malindi in Kenya, reached Goa in 1497. The tourist map of the region also drew me it. It showed a beautiful bay with a sandy beach at a walking distance from the hotel, The Citadel. After a quick lunch I inquired at the hotel reception the way to the beach. “You must not go to that beach to walk or swim. It is not good. You go to Bogmalo”, advised the young man. For 5 rupees, a small rickety bus took me to Bogmalo, 8km from Vasco. People in the bus were friendly, soft-spoken and talked freely. On the beach there are no public toilets and changing facilities. The 5-star Park Plaza Resort occupies the left end of the small but clean sandy sea front. Resisting the temptation to go there I entered the nearest ordinary beach restaurant and I changed in a scummy bathroom at the back. I could not stand straight in it, the floor was wet and muddy and it has a well-stocked live insectariums. I swam and walked to the other end of the beach, where a young soldier stopped me from going further because beyond is the Naval Centre. I chatted with him for a while. He told me about life in the army and his village. Like most young people in India, he wanted to go to a foreign country. Back in the beach restaurant, I ordered hot tea that was served in a pot in the English style – a perfect finish to a very refreshing and fulfilling outing. Waiting for the bus I whiled away time visiting a few souvenir shops some owned by Kashmiris; but I found nothing of my liking to buy. During the rest of daylight I saw Vasco and visited the fish market. Before going to bed I decided to combine my morning jog with solving the mystery of Vasco beach. I woke up at about 4a.m when I felt my bed sliding head-wards and foot-wards. The next day the newspaper confirmed that the area had experienced a mini earthquake. At daybreak I jogged towards the rail station and a well-trodden dirt path took me to an old rickety steel footbridge over the railway yard. On the other side I landed in a poor area. 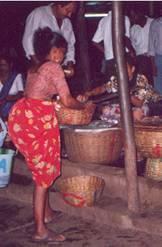 Some small food shops had just opened and owners were sprinkling water in front to keep the dust down. A short distance away was Vasco beach. The emerald seawater gently splashing a welcoming white sand beach must have rapt Vasco da Gama. When I surveyed the broad stretch on my left I saw rows of men crouching on their naked hunches and like penguins occasionally moving forward a short step having made their first scatological imprint. It is difficult to erase that image in my mind – I have seen people do that before, but not so many in so beautiful a place. What waste, just because people do not like using toilets. It can be a booming tourist centre. The mini bus that picked me up from the hotel at 9.30 for a guided tour was still waiting at the bus station for more passengers at 11.00 when it was already packed like sardines. Being single I was asked to sit on the engine cover. We were told that the bus would not go to Old Goa because strikers had blocked some roads. Tour of sea resorts on northern coast did not interest me. As I had not yet paid, I abandoned the bus. The bus owner commented, “We have to earn our meal as well”. It seems every thing had been predestined; the local bus across the road was ready to drive off as if it was waiting for me only. At the main bus station outside Vasco, almost within the minute I departed in the bus for Panaji. Half an hour later in Panaji I was on the bus to Old Goa. The layout of Old Goa and its numerous churches and historical buildings on each side of the wide road do not look Indian but a fragment of Iberian Peninsula. Of all the churches Basilica of Bom Jesus is fascinating, especially looking at the silver casket containing the body of St Francis Xavier perched high in a vault between intricately carved pillars. I returned to Panaji at 3.30pm and I walked to the Government Tourist office to purchase a ticket for a sunset boat cruise on River Mandovi. I casually talked to the officer about my visit to Vasco Beach. He expressed keen interest in my story and took me up stairs to meet the Deputy Director. He knew the situation and informed me that a set of public toilets was built and authorities concerned had tried to educate the people in the area. He said that it is difficult to break the habit of using the beach. The problem is complicated by continuous inflow of rural population that is not familiar with the toilet system. A bigger problem is intransigence of local politicians. 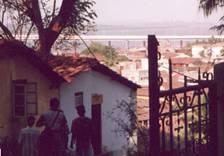 Panaji is an attractive city especially parts of Fontainas which remind of houses in Portugal. I visited a number of art galleries and saw a church service in the Chapel of St Sebastian. The church was full, a lot of devotees stood outside. The evening boat cruise wasn’t as spectacular as I was told. On board music and folk dances satisfied ordinary tourists. I watched the sun sink in the Indian Ocean. In the last bus to Vasco I met a couple and their small child who had taken the guided tour and had seen me get off the bus. “You did the wise thing. We were very hot and uncomfortable in the bus all-day and there wasn’t much to see”. The man is in the Indian Army spending his leave on the coast. I was checking out of the hotel when I mentioned to the manager my discussion with the Deputy Director of Tourism regarding Vasco Beach. “You should talk to the owner this hotel. She is the Chairperson of Vasco Municipality”, he said. Just then she walked in and we started to talk. “That is a red-light zone, you should not go there”, she advised. “We have a serious problem of drugs and aids there. We have built six public toilets, but no one uses them. Decisions taken by the Council cannot be implemented because local politicians do not co-operate. They demand free water and electricity to the slum dwellers to maintain the toilets. Educating the people in personal and public hygiene is not easy because most of them are poor and are afraid of paying for water supply and sanitary services.” Evidently she is very well informed and eager to bring about changes. Authorities are conscious of the problem; but progress is very slow. I hope I would be able to swim next time I visit Vasco. My niece, Cheeru, and her husband, Praful, received me with broad smiles at Pune airport. I had first met them soon after their marriage, in Hong Kong in October 1992 on my way to China. They fell in love when doing hotel management course in Pune. Cheeru is a Sikh from the Punjab and Praful a Hindu from Maharashtra. Their happy marriage is an indicator of rapid opening up of social values. Their three-year old daughter Ilvaki quickly charmed me into her playmate. In Hong Kong Cheeru worked with Cathay Pacific in charge of flight catering and Praful was a stockbroker. Both continue to practice the art of cooking. I savoured their dishes first in their apartment in Hong Kong and now in Pune. When Hong Kong was returned to China they returned to India and started a neat little restaurant “Malaka Spice” in Pune specializing in Indonesian and Malaysian cooking. It is located quite near the Osho Commune International (Ashram of Bhagwan Rajneesh), which is run and attended mainly by German, Italian and Japanese devotees. When they are tired of eating from the Ashram kitchen, Malaka Spice provides a good change. Cheeru manages the restaurant kitchen. She also sets up the menu for home and a house cook takes over. An appetising Maharashtrian dinner and talking with Praful’s father, Raghuvir, made the evening unforgettable. Saturday 8 April, my last day in India, turned out to be an unexpectedly, “spiritual” and educational. A refreshing early morning walk with Raghuvir was followed by yoghurt andpratha breakfast. A quick drive through Pune City did not remind me much of my 1968 visit. Like Bangalore, Pune is mushrooming in every way but a little more elegantly being a rich dormitory of crowded Mumbai. While I was enjoying eating vegetable noodles Indonesian style, Praful proposed that we should visit the Osho Ashram because he had never been there. It was like living in the dark shadow at the foot of a world-illuminating candle. I supported the idea although I had not planned to go there. He reserved us for the 2.30 visit. I have read some of Osho’s books and listened to a number of cassette tapes; all very impressive and convincing. We were casual visitors and did not wish to meditate. So we did not have to buy and wear maroon tunics nor prove HIV-negative to an on-the-spot test. Ultra modern facilities and computerised systems remind of Mediterranean Club without spiritualism. Praful inquired if we could visit Nalla Park. The soft-spoken receptionist said, “A senior member of the commune must recommend you”. Just than Praful was greeted by a rich Indian friend wearing a maroon tunic. Permission was granted and immediately the caretaker alerted by telephone. Our guide requested us to observe complete silence during the tour. The moment we entered the inner yard, we heard very loud disco-psychedelic music and saw in a hall without walls a big crowd of mostly white devotees dancing themselves, probably, into a trance. The rest of the tour did not interest to me much. Nalla Park is a short walking distance away. We were told that the tiny stream (nalla) had become so filthy with industrial and domestic waste that it was not only unsightly but it putrid smell pervaded the holy commune. With great difficulty, Osho managed to buy a stretch of the stream. Under his leadership and using financial resources available to him, he had the stream water cleaned employing sanitary and environmental experts and educating riparian population. Now clean water tumbles over arranged stones, although not totally odourless. On both banks is a well-maintained narrow park of tropical plants and trees. I admired Osho’s effort. He has created a model which should be emulated by numerous traditional but rich religious institutions like the ones I visited in Tirupathy and Patna to clean up their surroundings and educate the residents in public hygiene. In the evening Praful took me to the station and helped me to locate my seat in the express commuter train to Mumbai. Praful greeted a young man sitting in the adjoining seat. They knew each other well. He is a Bhagwan Osho’s devotee who came frequently to eat at Malaka Palace. He spoke English well enough so that we were able to converse during the entire journey. He is an Italian and has been to the Ashram a number of times. This time he spent six weeks. His main objective was to learn to cook all vegetable dishes served in the Ashram so that he could introduce some of them in his own restaurant in Italy. I wonder if he really benefited spiritually. We got off at Dadar and shared a taxi driven by a young Sikh who brought us to the airport rather fast.